In September 1986, The Bergen Record featured an article about Curt. It makes a fitting tribute to his life. It highlighted Curt's career in Baseball, and his struggles after his career ended. I have no information on Curt's life after this article appeared 15 years ago. I condensed the original article, omitting some of the details of his struggles after his career ended. Curt's quotes appear in red. ��At the time the article was written '86, Curt was enjoying his new home in Fort Laurderdale Florida with his new wife Lanna. He sat in his study surrounded by the awards and trophies from his days as a baseball player that, until just a few months earlier, had remained in a box where they could not remind him of what had been. � The thought was too painful. But now it appeared that he was reconciling the past and . . . . When he was a ball player, he was a celebrity. He had a private table at the Copa nightclub in New York. Don Rickles would kid him from the stage and invite him to his dressing room for drinks after the show. Everyone crowded around. Then his career ended in 1973. He went broke. He got divorced. He drifted from tending bar to selling insurance to frying fast-food hamburgers, trying to find something that excited him - that made him feel special - like baseball. There was no such thing. He was a ball player. "I am a damn ball player. And I will go to my grave that way." Now he sits in his study, the awards and pictures stare at him and he stares back. He can handle it now. Twelve and a half years of memories. They are mine and they can not be taken away from me." "There are a lot of men walking the Earth right now who wish they were in my shoes. There are teenage kids saying, 'Please God, give me one shot.' Say what you want. I did it. I was there." He was a ballplayer. He was a cocky kid from northern New Jersey, named by his father after Curt Davis, a pitcher for the Brooklyn Dodgers in the 40's. He broke into the big leagues with Baltimore in 1965, hit 22 home runs and was named The American Leagues' Rookie of the Year. Curt Blefary was going places, it seemed. Goodness, what an attitude. In the minors, he already was wearing shoes with Cuban heels, like a superstar. At Elmira, in the Orioles' minor-league system, the trainer called him 'Cadillac Curt' because he trotted slowly around the bases after he hit a home run, soaking up the moment, embarrassing the pitcher. When the Orioles sent him to the minors in he spriNg of 1964, he said "Nothing depresses me; I will be back." And he was. The next spring he ripped the ball all over Miami Stadium, then ripped Hank Baurer, the Orioles manger, for not playing him enough. Later he apologized. "Sometimes my mouth would get into gear before my brain was engaged. I did not get to the big leagues being shy. I got the attitude from my father. He said, 'Do not even try to make it son, unless you really believe you are the best. Otherwise you are going to be heart broken.'" Blefary's heart did not brake. In 1966, he hit 23 home runs, helping the Orioles to a World Series championship with his bat and his attitude. Says Frank Robinson: "He was amazing. He would wait at the plate for his pitch, and refused to swing at anything else. Drove me crazy. He would wait for his pitch and hit it." In eight seasons Curt had 112 home runs and 382 runs batted in. But when teams discovered he hit poorly against left-handed pitchers, he was in trouble. His batting average never exceeded .260 and his power declined. He played part time instead of regularly, which drove him crazy. "I had to play every day or I was mad." He was angry a lot. Ultimately, he was traded four times and out of baseball by 1973. He was 29 and certain that he still could play, but no one wanted him. Quickly his life began to disintegrate. Finely, after starting over eight times in eight years, after busting heads in a sheriff's uniform and a bartenders apron, after frying Big Macs and selling insurance and cars and himself to the few who would listen, Blefary had a place to go in the morning and a home to go to in the evenings. Finally. "I feel like I have everything. Just look around. I am not wanting for anything. I have a beautiful wife, a nice car, a prestiges position. Everything is great. But, you know, I still miss baseball." "Evidently, I did something to somebody during my career, because there is no way a 29 year old, left-handed-hitting catcher cannot hook up with someone, not even in Japan. No one has ever told me what it was. For me to be through then was ridiculous. I had 10 years left. I have never known what happened." "There are several things I can touch on, I was very outspoken. I let my mouth get me into trouble even though I knew I was right. There might be times when you have been partying too much and someone sees you and puts a label on you. It could have been different things. No one will tell me. But now, I really don't care." "I consider myself a God fearing man who loves his wife and family, and I don't care what people think of me." "If I died tonight, I would be happy." "Of course, I still would like to be in baseball in some capacity, but what am I going to do?" "I always held out hope for a miracle. For some firm or ball-club to say 'Hey, he made a few mistakes, but look at his record. In Baltimore especially, there are people who still would give the shirts off their backs by him. He was a good person. He never treated the little people badly.' � I always hoped that someone would see the inside of Curt and give him a second shot. The world would be a pretty crummy place without second chances." "It's all water under the bridge, to get back after this long, you have to have a rabbi, someone who watches out for you. I guess I did not have one." Ironically, as he has accepted this, he also has begun a slow re-entry into the game. For years he shunned old-timers games. Now he is going to them and loves them! He is like a kid in a candy store, seeing everyone and talking. Finely, he has carved out a life that satisfies him. He has learned lessons. When he becomes eligible for his pension in two years ('88) he will take the money instead of waiting until he is in his 60's. "My father never took a vacation for 40 years. Then he retired in July three years ago, took a cruise with my mom in November, and died in December at 65. I learned something there. I could probably wait till I am 55 to collect my pension, but why? To drop dead? I ran into walls for 13 years. I am going to appreciate that pension." He has plans now. He has written a book about baseball fundamentals and hopes to have it published. When he retires, he wants to open a baseball camp in the Florida Keys, where he loves to relax. And when he dies, he wants to be buried in his Orioles uniform. They gave me a break. "Curt said shrugging. It's fitting. In the end, and always, he will be a ballplayer. May you find peace in a 'Field of Dreams'. The last time I saw Curt was at the Ramsey -Mahwah Thanksgiving Day Game in '67. The image of him walking on the track that surrounded the football field in his designer clothing and sun glasses waving to the crowd in the stadium is as clear today as it was 34 years ago....... My claim to fame was bragging that in '60, Curt Blefary came to see me at my house. (It was an open house and everyone in town was there . . . . but .... he was at my house!!) I truly hope that he remained happy with the life he was beginning in '86, and that he was granted that final wish to be buried in his Orioles Uniform. If there is a baseball team in heaven, they just got themselves one damn good and eager left - handed - hitting catcher! The last time I saw Curt was at the Mahwah-Ramsey Thanksgiving day football game in 1967. �He showed me his Series ring. �He was some kind of athlete and he was a very nice person and would always talk to me about baseball. �I am sorry. 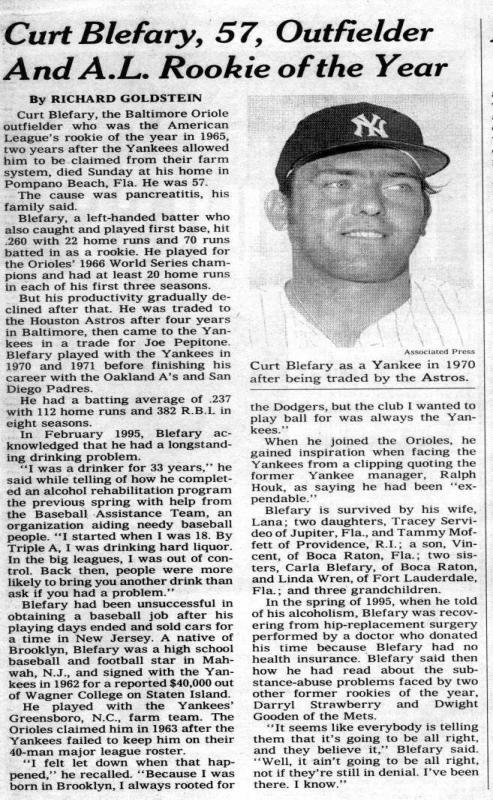 Thanks for forwarding the article about Curt Blefary to me -- I have often wondered what happened to him. �We were in the same class in high school and I knew him quite well. �Our dads worked together for AT&T and we played baseball together one summer in Mahwah -- I think it was Babe Ruth League �Curt was the star. �I also remember him as the star halfback on the HS football team . I remember when Curt signed his first contract with the NY Yankees for $18,000, which was a lot of money in those days. His dad let him buy a car for a few thousand and made him invest the rest in AT&T stock, � Apparently he sold the stock somewhere along the way. �If he hadn't he wouldn't have had any money worries later in life. Later on he was traded to Baltimore where he became for a couple of years a star. ��I was truly sorry to hear about Curt. I never knew him well, but, he was a memorable person in school. I was so unhappy to hear about Curt. I never knew he had such a colorful career--just to think that he had all that fame for such a short time, but it was his while it lasted. He lived life hard. I was a young baseball fan, I think the year was 1967. I was in Memorial Stadium when I saw my first grand slam. It was hit by Curt Blefary. I was a fan ever since. I remember when he caught a no-hitter by Tom Pheobus. I also remember on the back of his 1967 baseball card, they had a little cartoon of him playing records and the caption said: "Curt enjoys listening to rock 'n' roll records in his off time." That is such a hoot to think as late as 1967 it was still a big deal for an athlete to like rock 'n' roll. That just gave me more reason to love him! I was very sad to find out while surfing the web that he had died. RIP Curt. A special "thank you" to Dave Erickson '62 for the obituary notice.